Heading back from Kilchoman towards the main road, if there ever was such a thing on Islay, we turned and headed towards Port Charlotte and the revived Bruichladdich distillery. 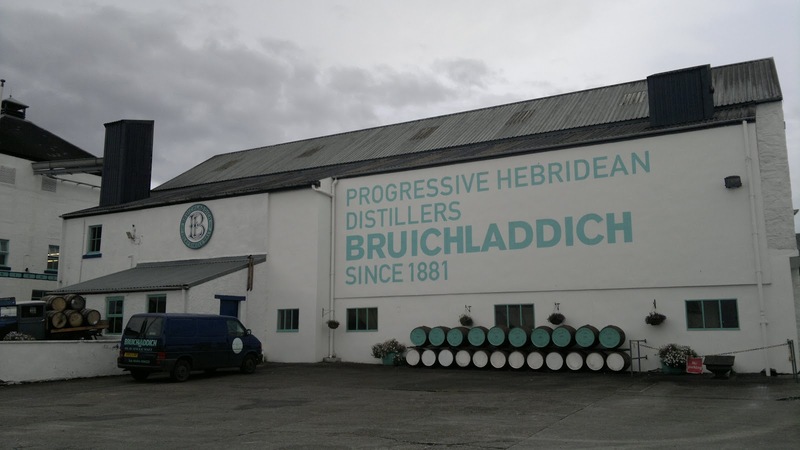 These progressive Hebridean distillers have made a name for themselves with their distinctive attitude and packaging and faithful methods. 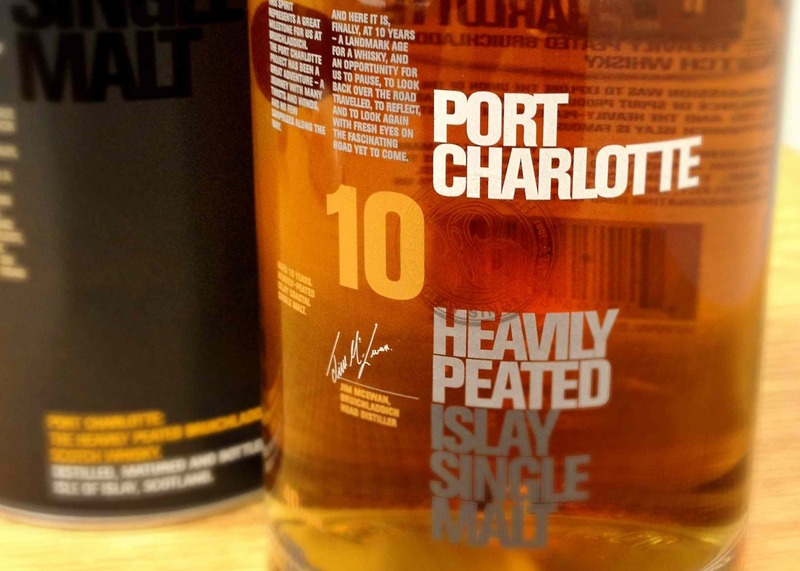 The Port Charlotte name and what’s left of the distillery also come under their expanding empire, which has recently been bought over by Remy for £58 million. 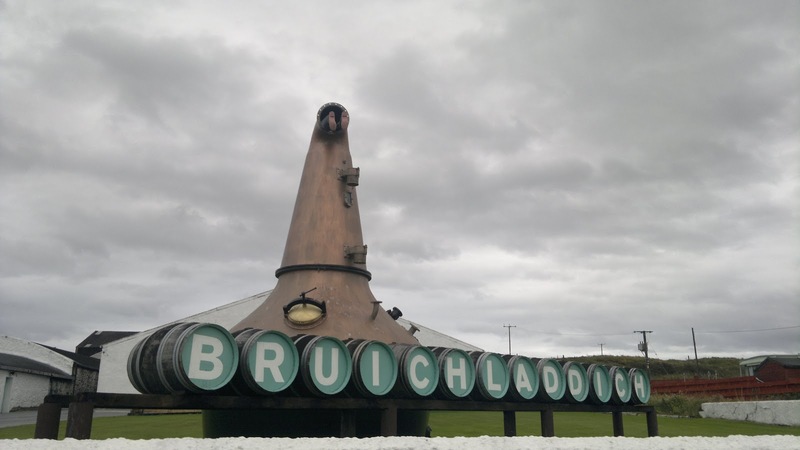 A fantastic result for all of those who revived the distillery and if Remy are shrewd with their investment, then they’ll let Bruichladdich continue without too much interference. Distillery tours are very popular on Islay and if you’re fortunate to visit, you’ll see the vibrant bags of Bruichladdich and its merchandise everywhere. Now, we’ll all know Bruichladdich like to do things differently and have cultivated that image of being a troublesome force in the normally still waters of whisky distilling. 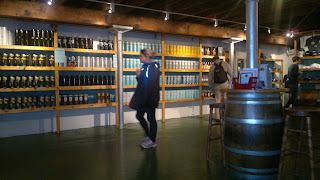 That attitude transcends into their tour which is very informative and takes you around the various areas of the distillery including the bottling area. 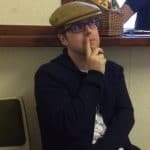 For want of a better phrase that punk ethic continues with the tour guides, with our lad being very humorous and full of tales and jokes. 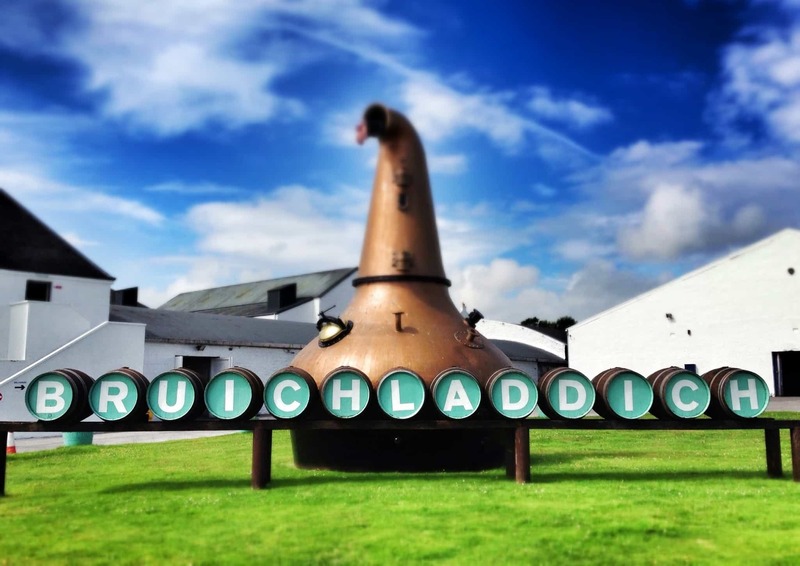 The tour costs £5 and is great value when you consider that the ticket entitles you to £5 discount at the distillery shop when buying a bottle. 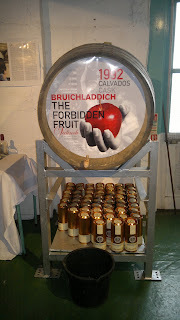 And anyone who know’s whisky realises that no distillery is as fertile and productive as Bruichladdich! I’m sure I read recently that in 2011 there were 40-ish different bottles, which much be a nightmare for collectors. On this visit I was very tempted by the Islay Barley with its golden colour however it is one that is generally available so instead I picked up the Single Cask 1992 Evolution Exploration with its golden promise barley type and bourbon cask; a special treat. The shop is marvellously stocked with the chance to bottle your own or purchase various bottles during your tasting session. A great surprise after finishing your single dram is the staff were very accommodating and offered tastings of most of their existing range – excluding some of the rarer releases. So I tried the Black Arts bottle and was disappointed; the finish was off-putting but I appreciated the opportunity to try before you buy. Ok, so what about the tour? A great feature is you’re allowed to take photographs as you please – if only more distilleries would allow visitors to do this! 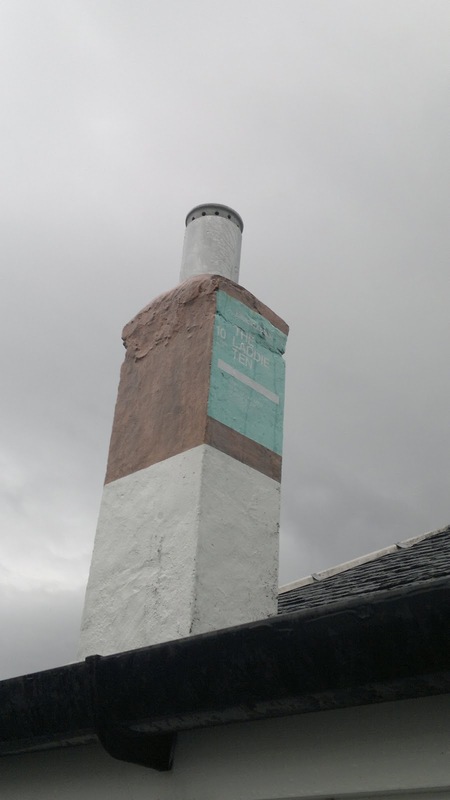 Generally there seems to be a common sense approach to health and safety; the distillery is the biggest employer on the island with 50-60 employees. 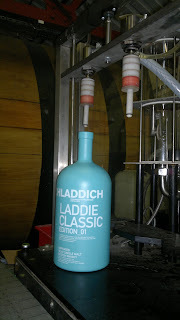 I don’t think I have seen such a hands on working distillery in existence today. The nearest comparison would be the frozen in time Dallas Dhu, which is run by Historic Scotland. 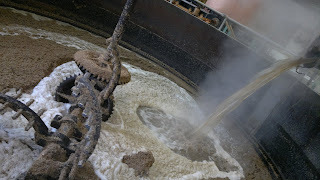 A great feature is the Mash Tun. Normally this is covered and out of sight. Part of the tour allows you to see their single, epic and old mash tun in action. We were encouraged while it wasn’t in motion to taste the sauce within. Yes, it’s a unique feature to this tour and the first time I’ve been encouraged and allowed to watch such a process. For the record on our visit, they were doing Port Charlotte. After watching this hypnotic motion for way too long, we moved onto the washback area with its the visually pleasing and traditional use of wood. 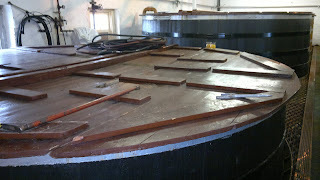 They say there isn’t much difference between metal or wood, but as I was to find out later on, Bowmore have reverted back to wooden washbacks so there must be something in the old methods apart from pleasing tourists. 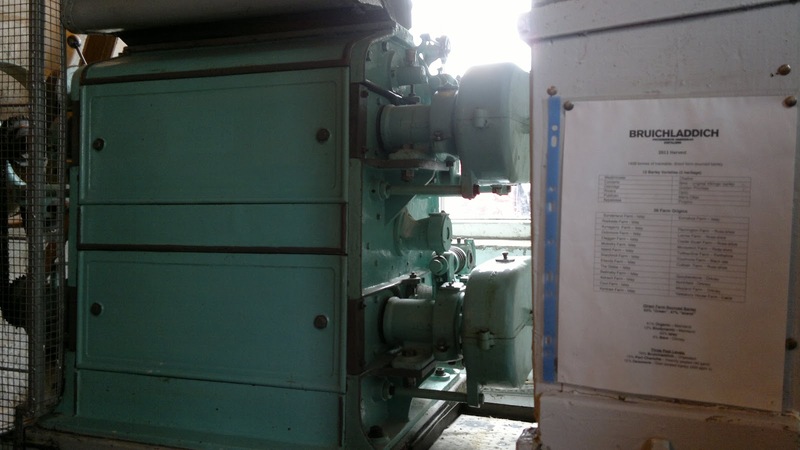 At the back of the washback room there is a smaller unit and this is one of the original washback’s that is still in use. You can see the difference in size above; again we were encouraged to taste the warm brew within these containers before we moved into the still room. Now this was something special as from a viewing platform we were able to see the whisky and gin stills. There is a distinctive still known as Ugly Betty and from memory I think she’s only 1 of 2 of this type still in use in Scotland today. She’s certainly different and creates a first impression. There are more detailed pictures as always available here for those unable to visit Islay. After the heat of the still room we moved onto a warehouse where we were able to wander and take in some of the marvellous casks. These included a range from other distilleries, special casks signed or others bought by investors to be bottled one day. It makes for an interesting piece of viewing and I always find the atmosphere wonderful in a whisky warehouse. Catching our breath it was off to another wonderful addition on this tour and that’s the bottling area. 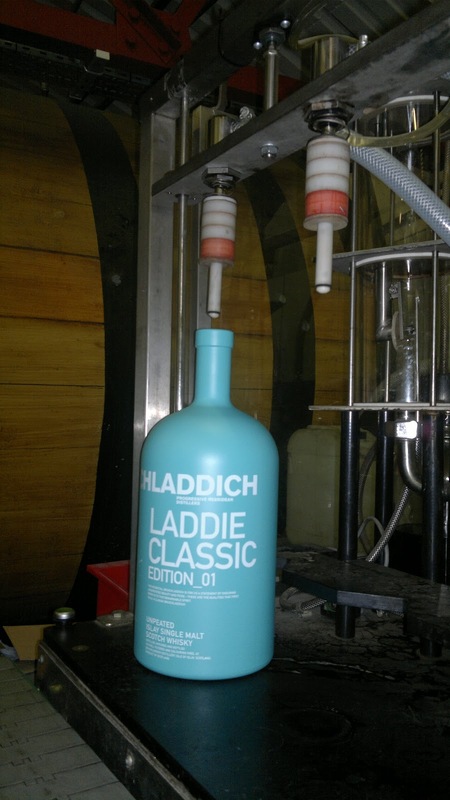 The team were reading to bottle huge bottles of Bruichladdich and on the way in we passed packaged palates for places afar as the Ukraine. 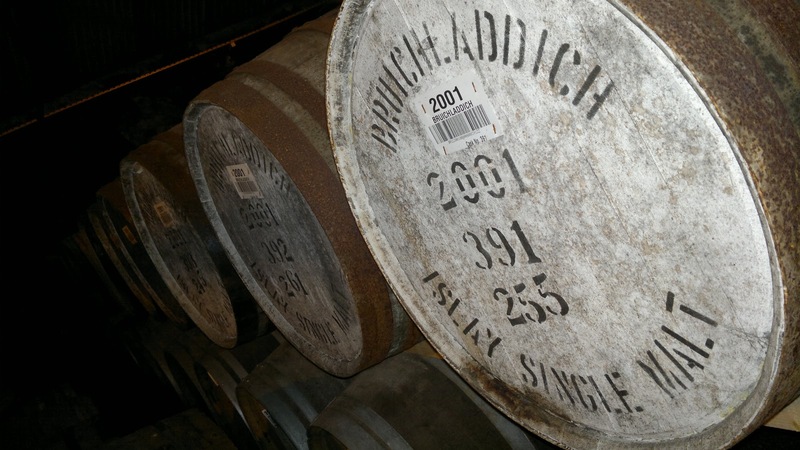 Unlike Caol Ila where the malt is taken off Islay to be distilled and later bottled, its reassuring to see Bruichladdich doing everything in-house and on Islay. So this makes this one of the most enjoyable tours as it represents the complete process from start to finish. 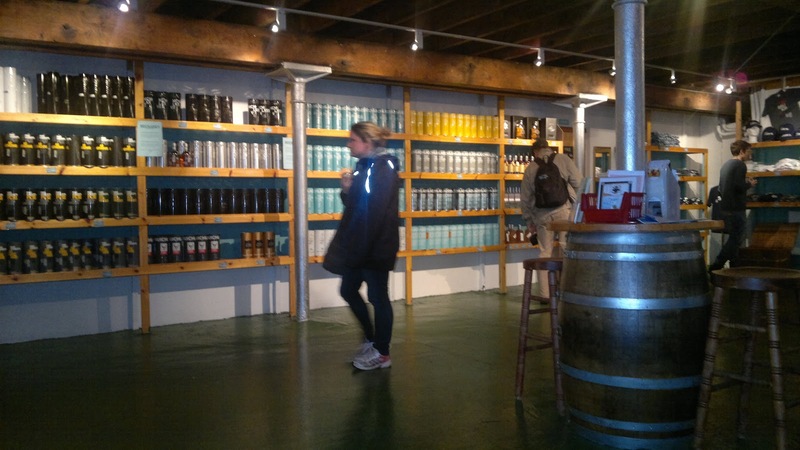 You then can round things off within the ample shop, tasting a dram before spending and if it wasn’t for flight restrictions, I would have bought a few more bottles. A great tour and as always my pictures are available right here for more snaps of the tour.